Have you ever struggled with anxiety? 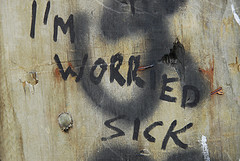 Like really ever made yourself sick over being worried? I can remember when I was in junior high and senior high school, I used to make myself sick being worried about everything! I was worried about getting papers written on time. I was worried about getting 100% A's on my tests. I was worried about having enough time in my day to practice trumpet. I was worried if I was going to be the valedictorian of my senior class. I was worried about the next music competition I was playing in or the next orchestra concert I had coming up. Man, I was worried about a lot of stuff back when I was a punk teenager. I used to get really bad stomach aches too as a result of being worried so much. My mom was constantly trying different home remedies, over the counter meds, and so on in order to help alleviate my symptoms. What I really needed to do, though, is stop worrying in the first place! I know I'm not the only one in this world that deals with worry, though. In general, we as a society worry too much. We worry about our spouses. We worry about our kids. We worry about our parents, brothers, sisters, and their families. We worry about if we can pay the bills on time. We worry if we’re going to lose our job in the near future. We worry if the American economy is ever going to really recover from this challenging downturn in which we currently find ourselves. If there was ever a time in recent history when we need a word from the Lord, then that time is now. It seems that everywhere we turn, people are really struggling in their present circumstances. They are struggling with money problems in a bad economy. They are struggling with health problems. Their family is in crisis. He tells us not to worry about our life. Life is more than just food, clothing, and financial resources (12:22-23). God takes care of the needs of those He loves (12:24-30). Be more concerned about the advancement of God’s Kingdom above all else. As a result, God will provide what you need (12:31-32). Be willing to part with your stuff in order to advance God’s Kingdom. Jesus reminds us in these verses that our heart follows where our treasures go (12:33-34). So, what are you concerned about, today? Have you turned that concern over to the Lord? Are you more concerned with the advancement of God’s Kingdom then your own personal needs or problems? If you’re going to be worried about anything, then worry about the expansion of God’s Kingdom. In the meantime, He’ll take care of your needs.